Highland aims to ensure that all children and young people make the appropriate progress in Literacy supported by developmentally appropriate learning and teaching. Structured approach to Reading Comprehension (Aspects will be trialled this year and will be rolled out by the Authority during 2018/2019). Highland’s Literacy Strategy has been updated as of April 2017. You can access this by clicking the images below. It details the Authority’s aims, their current priorities and includes key contacts and links to further support. The blog continues to be a medium of ongoing support, and facilitated by further training opportunities available through the Highland CPD Calendar and local support arrangements. 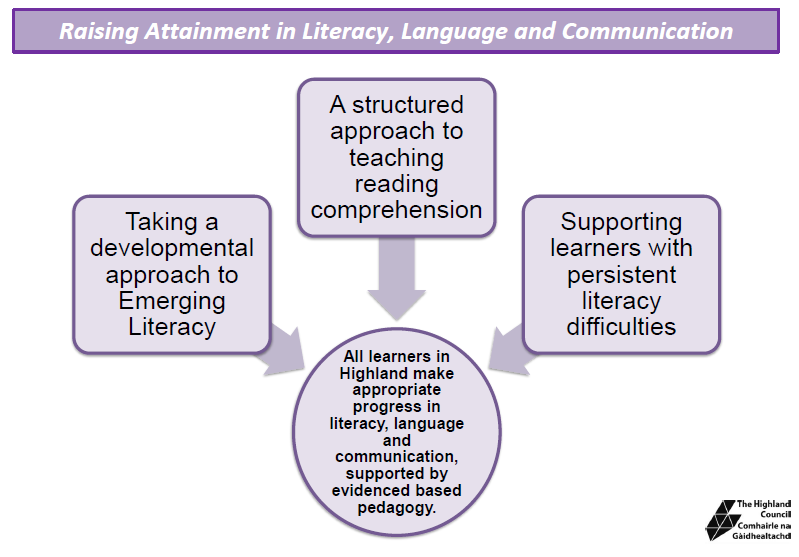 The up to date Literacy Strategy highlights the strong collaborative partnership working between education, Allied Health Professionals (AHPs), High Life Highland (Adult Learning and Highland Libraries) and partner agencies to provide the best possible literacy outcomes for children, young people and their families.